If you are experiencing significant hair loss after pregnancy, you will be relieved to learn this is normal. Many women will shed more than the average 100 hairs a day after giving birth. If a woman breastfeeds, the hair loss may be deferred until after she weans her baby. After months of having thicker hair during pregnancy, many women are concerned when they start seeing extra strands in their combs. Rest assured that is usually completely normal, although some of the common questions related to hair loss are shared by most new moms. How long does hair loss after pregnancy last? Most hair loss after pregnancy usually lasts between 3-4 months. While this hair loss may be significant, it is normally not severe enough to create bald spots or permanent thinning. The hair loss after pregnancy is usually associated with estrogen hormonal changes within the body. It is likely that you experienced an increase in hair production during your pregnancy and this is the body's way of bringing your hair thickness back to normal level. Sometimes there is a relationship between a low or high thyroid level and hair loss, so bloodwork can determine this. Avoid using hair dryers, curling irons, and hot rollers on your hair. Postpone hair coloring, permanents, and hair relaxing treatments until the hair loss subsides. Limit how often you shampoo your hair and always use a good conditioner. 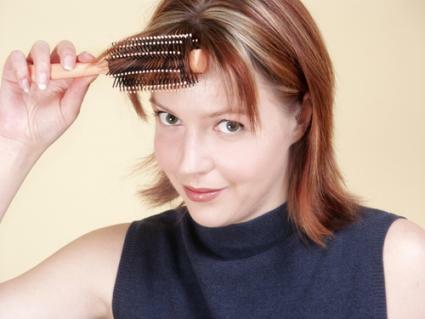 Use a wide-toothed comb or brush to get the tangles out of your hair. Avoid pigtails, cornrows, and other hairdos that may put stress on your hair. Will I lose hair after every pregnancy? Not necessarily. Every pregnancy is unique, and your body may react differently to each one. My hair is still thin. Is this thinness forever? It may take up to several years for your hair to fully recover from the hair loss after pregnancy, especially if you have long hair. Could my hair loss be due to something other than pregnancy? During pregnancy, hormonal changes keep you from shedding hair as you normally would. This is why most women experience a fuller, more luscious head of hair during pregnancy. Once those hormone levels return to normal after childbirth, it is only natural for the body to compensate for those many months of limited shedding by causing you to shed hair heavier than normal. There is no reason to fear you may become bald in the process, as the hair loss normally tapers off in a reasonable time period. You can relieve some of the hair loss after pregnancy by taking action to protect and nourish your hair today.